No one ever accused Foxconn of doing things small. Or for being subtle, for that matter. 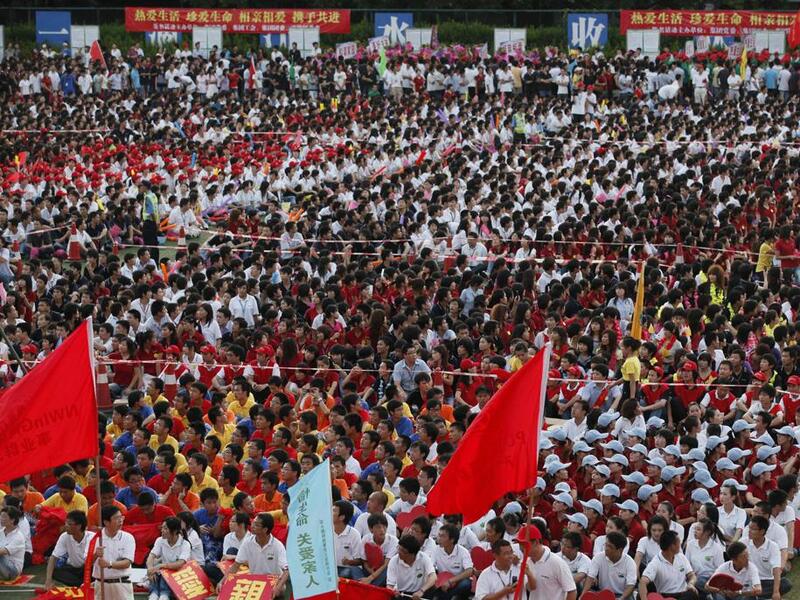 After a tough year in the public eye following the suicides of 12 employees, Foxconn recently held the first of many rallies with the theme, “Treasure your life, love your family, care for each other to build a wonderful future”. The rally was held at the Shenzen factory in China that employees over 300,000 employees, and was the site of the bulk of the suicides– including the most recent death of a 22-year old woman that committed suicide. Similar rallies are planned at all the factories in China. Foxconn has 16 plants, with 920,000 employees in China alone, and the company is expected to grow to about 1.3 million by next year, according to an AP report. Foxconn, owned by the Taiwanese company Hon Hai, has received massive, worldwide criticism for its working conditions that came to light following 12 suicides, and several more failed attempts. Soon, the Chinese plant where the majority of deaths occurred, quickly gained the media spotlight, and instead of being known as the world’s largest electronics manufacturer, Foxconn became the focal point of a growing movement within China to shed the harsh working conditions that made it the top manufacturer in the world. Several worker protests began around the same time, including a strike at a Honda plant in China that also gained widespread coverage, but it was Foxconn that kept the attention of the world. At first, the reaction was slow, and even somewhat ridiculous, as Hon Hai officials asked employees to sign letters stating they would not kill themselves. Upon hearing the collective hand-slapping-forehead sound of the world’s media, Foxconn then removed the benefits promised to the families of suicides, which was almost certainly the worst thing they could have done when faced with a PR crisis that painted them as a heartless sweatshop. Then Foxconn got serious about changing things and decided to raise the pay of the workers in its Chinese plants. The raises were generous- in some cases as much as double the current pay- but there were issues. Some suggested that the move coming as suddenly as it did, could radically affect the working class in China, who are slowly becoming more united and less likely to continue to acquiesce to the harsh and demanding working conditions that have served China’s economy so well. And then, there is the matter of how Foxconn would make up the difference. The first choice was to raise the manufacturing costs across the boards, but other suggestions have Foxconn moving the majority of its manufacturing to countries like Vietnam where the labor is cheaper, and automating several plants. Then there was the 250 people accidentally poisoned in Foxconn’s Indian plant, and the 12th suicide last week. In response, Foxconn did what it does well when faced with a potential human problem. It reacted in a giant, and bizarre way. The rally was meant to encourage Foxconn employees to embrace their jobs, embrace life, and embrace Foxconn as a company. And if that doesn’t work, the Taiwanese company also announced that it would add a new feature to its plants- suicide nets to catch potential jumpers, similar to the nets that a 22-year old woman jumped into a few weeks ago. In a wild turn of irony, she survived the fall, but was killed by injuries sustained from the netting. The rally was deemed a success, as the stadium was filled with employees chanting slogans, and wearing shirts that said “I Love Foxconn”. Many wore costumes ranging from cheerleaders to Spider-Man, although it was somewhat unclear why. Others still held signs that featured Hon Hai founder Terry Gou, with hearts featuring words of support that were almost certainly given to employees by Foxconn. “No matter how hard we try, such things will continue to happen,” Louis Woo, assistant to Terry Gou of Foxconn’s parent company Hon Hai Precision Industry said in a statement. Beyond the flash of the rally, there were a few announcements that should actually help the labor conditions. Employees, who now regularly work 80 hours or more of overtime will be limited to 37 hours, in accordance with Chinese law. There will also be regular rotation between jobs to keep workers interested, as well as opening up the possibility of advancing in a field suited to the employees. Google just announced a major revamp of YouTube Music, with an ad-free paid version called YouTube Music Premium. It's also changing YouTube Red to YouTube Premium. So what happens to Google Play Music? Here's what we know.